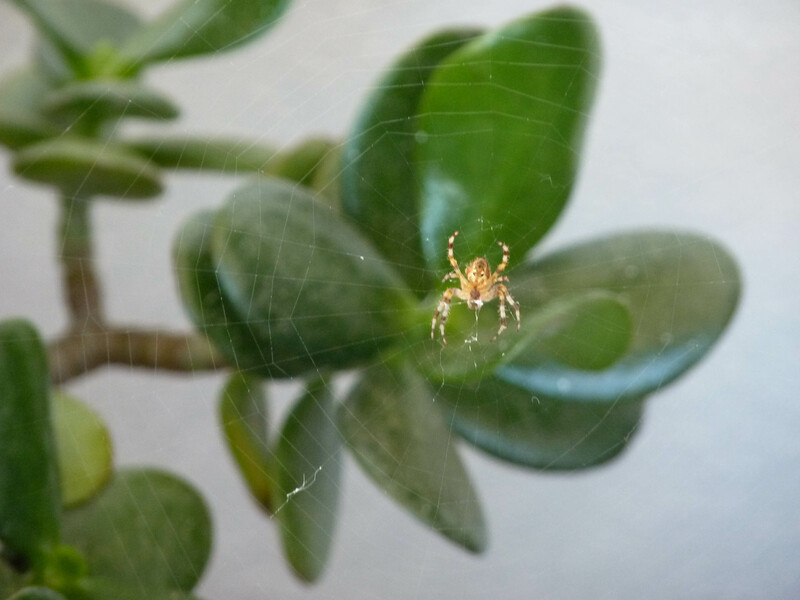 I was removing the weeds around my Jade plant when I came nose to eyeball with this tiny yellow spider. No I did not scream; I’m not that much of a wimp, but I did go and grab my camera. Look at it’s eyes – awww it’s so cute! I’ve just spent the last thirty minutes trying to identify my new friend, but without success. I am always interested to know whether a bug is likely to bite or sting me so I can take the appropriate action. Call me cautious but, the most innocuous looking spider I’ve seen in Portugal is the Brown Recluse Spider looks harmless and if you are bitten you MUST seek medical advice immediately. Can anyone with a spider fettish identify my tiny yellow friend? Wow, that’s a great picture PiP! Very brave of you not to freak out when seeing a spider 😉 I usually don’t mind them that much either. I was a bit close for comfort when I discovered it…it was virtually on the end of my nose before I focused and it came into visions…YIKES…I would have screamed if it had been larger…. Spider bites can be nasty. The brown recluse is one of the worst. Black widows are too friendly either. The brown recluse is one of my terrors! Don’t think we have black widows in Portugal errrr better go and check! PiP, I love the photo of the tiny yellow spider. I don’t know my spiders, but it does bear a resemblance to one that is prolific here in Florida, USA (although it does not look like the same kind). The one I’m familiar with also has “stripes” of yellow and black on its legs. But, it’s body is long. Due to the body shape and length, it is commonly referred to as a banana spider. It is also called a golden orb spinner. I think they are beautiful. Thanks for sharing your little specimen. What a lovely tiny thing to share! I am on a mission now to identify it! I’ll look at the 2 you mentioned. I have no idea but very nicely taken! Did you do a before and after- these are the befores- the afters are, of course, the squashed. Kidding…. Hi amberangel, no I could not stamp on that poor incy wincy spider…now if he was likey to bite me that would be another matter. What an absolutely beautiful picture! Excellent PiP! There is absolutly no room on this earth for me and a spider. These eight leg creepy crawlers-give me the hibbie-gibbies !!!!!! The ones I saw when living in Panama-were huge !! and I made sure to stay my distance !!! I used to be the same…now I’ve adopted a different approach. I still scream when I come across some of tthe bigger ones unexpectadly! Wow, lucky you to live in Panama they have the most amazing birds and flowers. Can’t help with identifying that tiny spider PiP, but it’s a great shot! I am told the spider that crawled over my hand was a wolf spider when I was planting up some seedlings. IT was in the compost bag. is this a smaller version of the one you saw? Hi Frizz thanks for sharing your link! I’ve killed some brown recluse spiders before…..and once a black widow….NOT spiders to mess with, those! Nice shot Pip! Hope you manage to identify it. Is there nature museum anywhere near you?Or a university maybe? In fact, I’m sure I’ve seen web sites where you could send photos and ask for help identifying them (you have to say where it was taken). 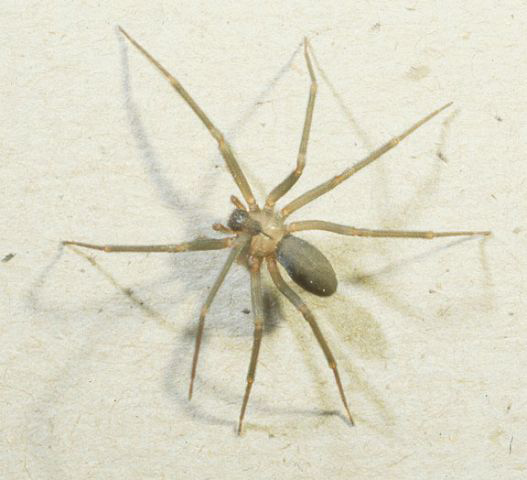 We have the brown recluse here in Chile, where they’re called “arañas del rincón” (corner spiders). They can be deadly, although fortunately I’ve never seen one. Unfortunately, there is not a museum or university near us in the Algarve. I’ve just been searching on the web again now. I’ve looked at 100’s of spiders and nothing…in fact I don’t know why I look at spiders before I go to bed, they give me the eeby jeebies! Oh, what I would give for your photography skills, PiP! You’ve given an arresting drama to the littlest spider. It’s beautiful! Cute? Absolutely not. Fascinating though… from a good distance. I am NOT a fan of spiders of any kind. That’s funny because my boyfriend is more afraid of spiders than I am. He will not scream, no, but he really doesn’t like them, me I just don’t care if they are not dangerous. I cant sleep with anything that crawls in my bedroom. I woke up once and I was eyeball to eyeball with a massive bug. It was resting on my pillow watching me. When I opened my eyes, focus, and saw it. I jumped out of bed screaming the place down. Poor old Mr P nearly had a heart attack. Awesome photo! It’s such a cute little yellow spider. 🙂 I loved his little eyes…or are spiders she? I made a praying mantis post and replied to your comment in my ‘Weekly Photo Challenge: Tiny’ post, yes you may use my photos. I’d love to use one of your male photos? I look forward to your reply. I didn’t get your email. For some reason, my email-host has stopped delivering… I’ve contacted them and they haven’t resolved the problem… sooo I just this morning canceled that account and changed my wordpress email address to a gmail one. If you don’t mind, would you resend the photo to my new gmail address. Thanks. it’s an orb weaver (araneus species or the like) and completely harmless. 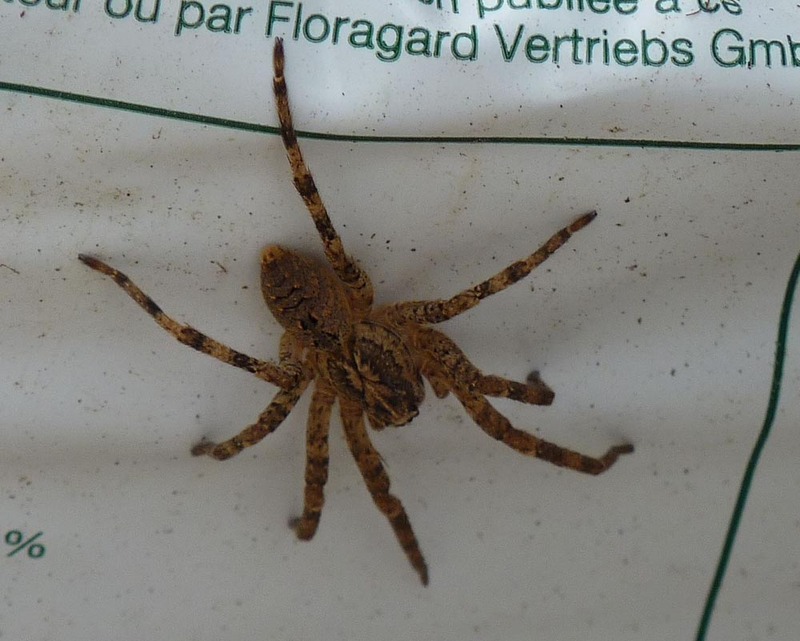 The other spider posted is a type of wolf spider: https://en.wikipedia.org/wiki/Zoropsis_spinimana, also completely harmless.